Text & Photographs By Lars S. Madsen © All rights reserved. 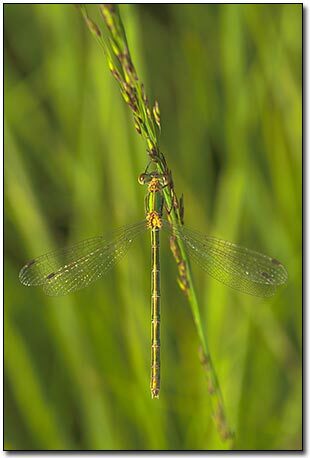 My interest in damselfly photography was actually kindled some time during the summer of 2003 while I was attempting to photograph the Red Deer of Jutland in Denmark. One early June morning I am sitting, looking for Red Deer by a small lake in mid Jutland where I know the deer regularly come. It is just after sunrise but I have already been sitting there for a couple of hours, waiting without any result, just like the evening before. I am close to concluding that there will not be any pictures of Red Deer this time and that is actually also quite okay with me. After sitting for a total of 10 hours on a somewhat uncomfortable folding chair in what was first baking heat the day before and then in cold and clammy morning fog this morning where the highlights have been a Raven passing far overhead and a few Wood Pigeons coming down to the lake for water I am actually starting to get a bit bored. While the first sunrays clear the spruce trees that surrounds the pond, myriads of damselflies emerges everywhere while they are waiting for the sun to warm them sufficiently to be able to fly. The tiny insects are covered in dew drops and in the orange glow of the morning light they resemble tiny glittering jewels as they cling to each their own straw. Quickly I changed tactics; the tele lens (on which the front element was covered in dew anyway) was replaced by a macro lens by which I was hoping to turn the events in front of me into photographic master pieces. It didn't take long however before I had to realize that the dense dew was both good and bad: good as the light became perfect as it pierced through the morning fog and because the moisture condensed into the finest little dew drops on plants and insects but bad because it also condensed into the finest little dew drops on the photographic equipment and because boots and trousers were quickly soaked. While I was jumping from tussock to tussock trying desperately to photograph what I was seeing before the insects were heated up I miraculously managed to get a number of images that were quite okay. Actually the images were so good I decided to put some more effort into damselfly photography after seeing the results from that morning. This article will concentrate on photography on fully developed damselflies although the often ignored area of larvae photography holds interesting possibilities, as with any area of nature photography only your imagination defines the limits. Damselfly photography is obviously much like any kind of insect photography although one needs to keep a few details in mind when attempting this specific branch of macro photography. As an example the fact that the small size of the damselflies demands dedicated macro equipment like macro lenses, extension tubes, teleconverters or close-up lenses in order to be able to depict any kind of detail on the insects. Personally I prefer my trusty old 90 mm Tamron macro lens as it is a perfect compromise between reach and the ability to photograph hand-held in natural lighting, at least for me. 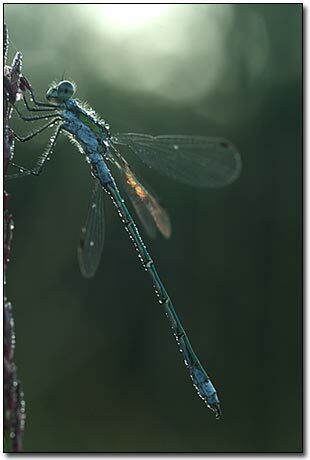 Extra care is required in order to keep the damselfly parallel to the film plane as the long body of the insect will otherwise result in an image where the front is in focus but the rear is not or the other way around. One could of cause want to do this on purpose as an effect but it will be obvious to anyone if this is done consciously or it is just a result of poor technique. Most species keep their wings parallel to their body when resting which makes use of a relatively low depth of field possible compared to photography of beetles for example. This makes it a lot easier to obtain a nice and 'creamy' and even-coloured background than by photography of more 'round' insects. 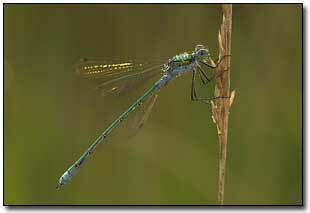 Be careful not to let vibrations due to wind ruin the shot, an average sized damselfly weighs just fifty milligram, one twentieth of a gram. Obviously any amount of wind will make photography challenging. The damselflies are much more cooperative early morning and late afternoon when their body temperature is low than when the air is warm allowing the insects to fly around but when they are sitting in the vegetation they can be very difficult to find. I have used a simple technique myself which simply is to sit down on the same spot for 10-20 minutes at sunrise and watch the vegetation. This way you will gradually spot the insects as they emerge from the dense low vegetation and crawl up on grass and branches to let them selves be warmed by the sunlight. If you just thunder head-first through the vegetation chances are you will not see the insects and even if you manage to find some they will probably attempt to hide away and be difficult to photograph. Even if the insects are slow when they are cold they will still be spooked if you approach too fast with the photographic equipment and if that happens they will attempt to hide somewhere they cannot be easily seen or as a last desperate attempt let themselves fall to the ground. Not all species of damselflies are easy photographic targets; some species prefer to stay in the swamp resting on Bulrush and Reedmace or on the floating leaves of water-lilies and when photographing these species a small boat will come in handy although in most situations a pair of rubber boots and a good dose of patience will suffice. Photography using a tripod is difficult as the insects will most often fly off if one accidentally bumps the tripod against the vegetation when setting it up. Mid-day the insects are usually too active to wait for the tripod to be set up anyway. A useful compromise could be a monopod which is much easier and quicker to set up but which at the same time is quite useful to help steady the camera. I rarely use artificial lighting myself but flash photography absolutely has its merits. Especially on days where the light is not strong enough to attain the desired depth of field and shutter speed or when the light is too bright resulting in solid black shadows without a flash to loosen up the shadows it is difficult to do without artificial lighting. As always one has to be aware that the use of flash can result in a totally black background if the distance between the flash and the damselfly is much smaller than the distance between the flash and the background. It is up to one self whether to see this as 'dramatic' or 'phoney-looking'. If one belongs to the group of photographers who prefer to be able to put a species name on a particular damselfly then they will have a challenge as many species look alike on first glance. That is the reason that a deep knowledge is required to be able to know which distinguishing features should be clearly visible on the photos if they should have both an artistic as well as a documentary value. The backside of the head, the 'chest' (thorax and prothorax) as well as the first and last parts of the abdomen will in most instances provide the key information needed in determining the species. I myself have spend quite a few interesting hours by lakes and rivers while searching for damselflies to photograph after my first 'damselfly experience' in 2003 and would heartily encourage anyone to grab the camera and the rubber boots and get out there. 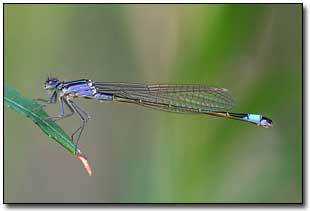 The damselflies are waiting out there!